Sammydress contacted me a little while back and asked me if I would be interested in doing a product review for them. Because I've never shopped on a wholesale site before, I said yes, so I could remember the experience in the future, if I ever wanted to. Sammydress is an Asian wholesale website--meaning they price the clothes low so companies can buy them in bulk to sell at their stores. Because they do price their clothes for incredibly affordable prices, they're a popular site for the average person to shop on. 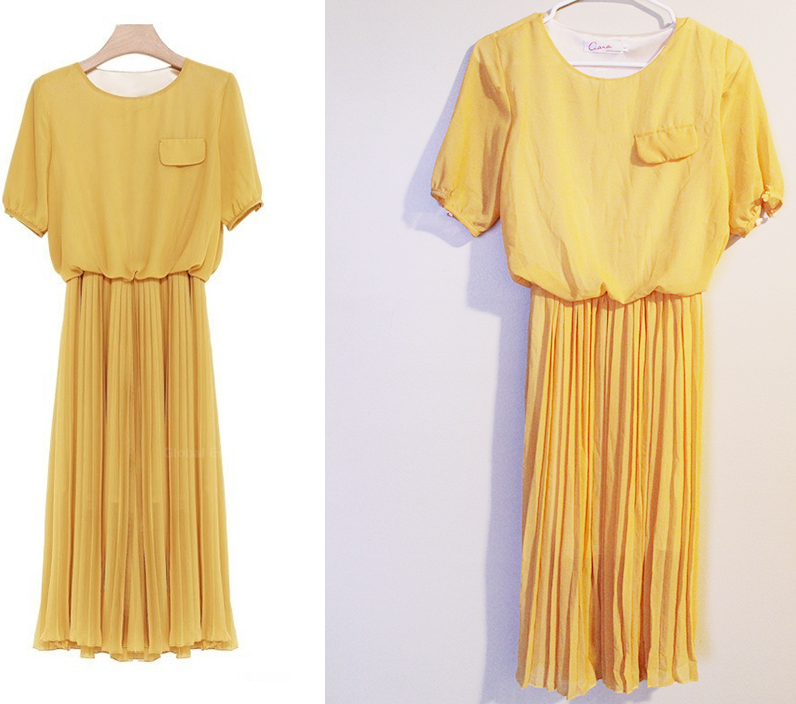 I ordered this dress, it's a long yellow chiffon dress. Summer is approaching and I'm travelling to California in July, so I wanted a comfortable, lightweight dress to wear while travelling. I couldn't pass up the beauty of the yellow and I liked the defined pleats in the skirt, so I chose this dress. Because Sammydress's sizes are more catered towards the Asian market, the sizing is a little off-putting. I mean, I'm a plus size American girl, and Asian clothes tend to be made for the smaller person in mind. Because of this, I wasn't expecting much. I was contacted my Sammydress on February 26th, and I put in my order February 28th. After two failed delivery attempts by USPS, I finally picked up my parcel at the post office on April 8th. The dress itself is made of polyester, and it's smooth and soft, and the skirt is nicely pleated, which is lovely. It's mid calf length, with a faux breast pocket and a sleeve button. This dress is super tight around my arms and chest. I'm not a large chested girl, but this makes me feel like I am. It is an XL, but in some places, if feels more like a medium. But, it's not a bad dress. It doesn't have many loose threads or any damage, and the color, fabric and length are all true to the description. The seams aren't even unraveling. It's just a little small on me. Now, if it were sleeveless, I could probably wear it with a thin bandeau under it. I might even alter it for it to work that way. But, currently, without any alterations, it's incredibly difficult to put on and take off. If you're a plus sized girl like myself and want to check out Sammydress, I would recommend looking at the plus size section. Also, know your measurements before ordering, because then you don't have to guess. I would recommend Sammydress to those who want cheap clothes and don't mind waiting a little to get them. Also, if you're tiny, there's a ton of things on Sammydress for you. I would definitely recommend this site to you tiny gals out there. Have any questions or comments? Let me know down below! Though I was given this item free by Sammydress, my opinions are my own and I'm not being paid to give them. That is actually a very pretty dress! If you'd like to follow each other, do pop by my blog! My GFC, Bloglovin and Google+ links are in the sidebar. Just let me know in the comments once you've followed. I follow everyone back. Sandy | SMXYC: Lifestyle. Beauty. Fashion.